Salvation And Survival: Do We Even Know What It Means To Be "The Church"? Do We Even Know What It Means To Be "The Church"? Yesterday, I expressed my concerns and frustrations regarding the institutionalized "Church", and how my spirit senses that we are stifling the full image of Jesus and His ministry. That got me to thinking ... What did Jesus expect of the Church? How did He envision it? And is it what He intended it to be? There have been 20 centuries since our Savior walked this earth and the Church came into existence. As we are well into the 21st, I think it's time we take a good hard look at ourselves and determine if we even resemble what He began, and if we are serving His purpose for the Kingdom of God. First of all, you can scour the internet and find all kinds of commentaries and discussions on what the Church should be, and more often than not, it seems that it is from man's perspective -- it is what we have decided the Church should look like from hundreds of years of internal deliberation and analysis. But is that what really matters -- what we have determined? Because, I would venture to say that if you asked ten Christians what Jesus intended The Church to be, you would probably get ten different answers, depending on their denomination and generational biases. If you had to find the common denominator among those varying opinions, you would probably come up with a checklist describing the Church as something close to the following: 1) a community of prayer based on the Word; 2) we are to worship God; 3) we are to make disciples; 4) we are to be in genuine fellowship with one another; encouraging each other in our walk with Christ; and finally, 5) we are to proclaim the Gospel to the rest of the world. All of those are good descriptions; no one could deny their importance. But do they represent what Jesus conveyed as His charge to those who would follow Him? Consider this ... Did you know that there are only two instances that Jesus even mentions the word church in the four Gospels? The first is in Matthew 16:15-19, where it is my opinion that Jesus describes the spiritual aspect of what "Church" means to Him. In this passage, Jesus acknowledges Peter's confession of faith in Him as the Son of the Living God, and tells Peter that on this rock I will build my church, and the gates of Hades shall not overpower it. 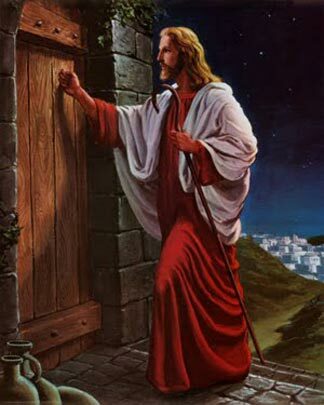 Peter is also told that he will be given the keys to the Kingdom of Heaven, and whatever you bind on earth will be bound in heaven, and whatever you loose on earth will be loosed in heaven. I would like to encourage you to read my post on this passage, as it will clear up what I think is a mistaken image of establishing an "organized" church model, with Peter as the head. Here is a quick synopsis of what I think Jesus meant (and I hope you will read the entire post to get the full context): Where this talk took place, and what Jesus said, would have made Peter and his fellow disciples very uneasy. They knew they were standing on the ground where the Fallen Angels landed on their descent to earth (in Genesis 6:1-4), and it is ground that the Nephilim had inhabited. In Jewish theology, the spirits of these dead warrior-kings were demons. Jews believed that this area, with its connection to Fallen Angels and temples dedicated to Zeus and Baal worship, was the entryway to the underworld -- the gates of Sheol, which simply means “the place of the dead” or “the place of departed souls/spirits.” (The New Testament Greek equivalent is Hades, or in English, Hell). In this case, with its history involving Fallen Angels, this was a place of evil departed spirits, or demons. Therefore, Peter clearly understood what Jesus was saying -- that when He referred to "the rock" on which He would build His Church, He did not mean either Peter or Himself. Peter and the other Disciples knew Jesus was talking about the very rock on which they were standing -- the foot of Mount Hermon, the demonic headquarters of the Old Testament and the Greek world. So when Jesus declared His plan to start His Church on that very spot -- on the top of the gates of hell -- He is saying that He would crush both Evil and Death, and bury them! He is saying that He intends for the power of His Church to be like a huge rock that will smash the rocks upon which the gates of hell rested -- and He intends His Church to take the fight to the Enemy! I believe that Jesus is expressing His plan that those who would follow Him in faith (that is the Church; and Peter being the first in time, not authority) would be given the "keys to the Kingdom"; in other words, the power to help establish Heaven on Earth -- which was God's plan from the beginning in the Garden of Eden. God wants His realm -- His Kingdom -- to be the same on Earth as it is in Heaven. That means no pain, no illnesses, no demonic attacks, no poverty, no fear, etc. And that is the primary message Jesus came to deliver! By healing infirmities, casting out demons, and sharing the Gospel of the Kingdom, He is telling the world that He came to help institute Heaven on Earth -- and to show us what God's Kingdom looks like. I believe Jesus meant the Church to be those who would share these same goals. He gathered around him a group of disciples who participated in His spiritual healing power and teaching. And I believe He fully intended His disciples to carry on His work together, as the Church. But He makes it clear that He desires that everyone who would follow Him be on the same page as to His goals for the Kingdom. And that's where He mentions for the second and last time, the word Church. In Matthew 18:15-20, I believe we get a more accurate picture of how Jesus saw the physical image of what we have come to know as the Church. He is addressing His disciples on how to handle a community member who has separated himself from the community and refuses to listen. Jesus said, If he refuses to listen to them, tell it to the church, and if he refuses to listen even to the church, treat him as you would a pagan or a tax collector ... Again I say to you, that if two believers on earth agree [that is, are of one mind, in harmony] about anything that they ask [within the will of God], it will be done for them by My Father in heaven. For where two or three are gathered in My name [meeting together as My followers], I am there among them. Now this is where I am probably going to lose those who are well entrenched in their mega-church buildings, and those who like their image as part of a particular Christian organization or established religion. First, we need to acknowledge that the word "Church" is not the word Jesus would have used. Secondly, we have no actual way of knowing what word Jesus used, because He would have spoken in Aramaic, and we have no Aramaic translation of the New Testament. However, when Matthew made his own personal translation of what Jesus said in Aramaic, he felt that the best translation of what Jesus said in Aramaic was the Greek word, ekklesia, which means "a gathering" or "assembly" in English. 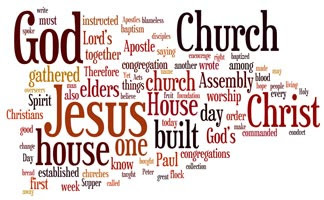 But note how Jesus describes what our English Bibles call "the church" in Matthew 18 -- He clearly says that where two or three are gathered in His Name, they are meeting together as His followers, and constitute a gathering, an assembly, a congregation [a fellowship], a church of Believers. So how did we get to this "written in stone" concept of Church as a hierarchy of institutionalized religion and symbolized by an image of a building full of people? Perhaps when His Second Coming didn't happen as quickly as the disciples anticipated, they set about establishing some sort of an organization to carry on after their lifetimes. I believe the early communities of disciples and Believers tried to carry on His physical/spiritual healing and His teachings that centered on establishing God's Heavenly Kingdom here on earth; of binding evil on Earth as it is bound [restricted] in Heaven, and loosing God's healing on Earth as it is loosed [unleashed] in Heaven. But as the apostles and First Century disciples passed from the scene, the message of establishing the heavenly Kingdom on earth began changing to a message of personal salvation, which was a product of faith in Jesus. "The Church" made Salvation their primary message, and sadly, I cannot dismiss the selfish implications of this thought -- not that Salvation through faith in Jesus isn't important for our eternal destiny, but the message of Salvation is all about us. The Message of the Kingdom of God is all about Jesus and the Father! Jesus clearly told us that He was sent for the primary purpose of preaching the Good News of the Kingdom of God (Luke 4:43). 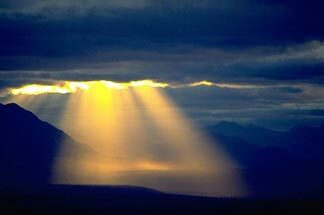 Furthermore, He admonished us to Seek first, the Kingdom of God (Matthew 6:33). So have we done that? Are we, as "The Church" an embodiment of His teachings and commandments? Have we gathered in small communities and assemblies and promoted the idea that we, as His followers, are to bring about the Kingdom of God on earth -- as it is in Heaven -- by healing the sick; ridding the earth of the influence of Satan and his demons; teaching others what it means to have faith in Jesus and receiving the gift of Salvation and eternal life in return? Jesus told us, My sheep hear My voice, and I know them, and they follow Me; and You will know them by their fruits. Grapes are not gathered from thorn bushes nor figs from thistles, are they? Again, I always feel as if I must tell you that I am not indicting the entire Body of Christ or those that choose to worship Him in fellowship in buildings. I simply want all of us to look deeper at what Christ has chosen to reveal in His Word. And I want all of us to consider this question, as posed by the website, The Real Truth: If Jesus walked the earth today, and had to choose from the myriad of Churches in America, would He choose to attend your Church? Remember, at the end of His earthly ministry, and just before His ascension into Heaven, He gave a command to the soon-to-be apostles: “Go you therefore, and teach all nations, baptizing them into the name of the Father, and of the Son, and of the Holy [Spirit]: teaching them to observe all things whatsoever I have commanded you” (Matt. 28:19-20). So, do our churches observe ALL THINGS as commanded by Jesus? If He walked into any church in America today, what would He hear, or what would He find? Isn't it acceptable to think that whatever Christ taught the original apostles, He would expect to find in His Church? Would He find a Church that taught the foundational principles of His teachings, or one that extolled their own denominational doctrine? Would He find your church celebrating the Holy Feast Days as commanded by God, or observing man-made holy days called Christmas and Easter, while rationalizing that they commemorate Him? (And then ask yourself this question: Do you think Christmas and Easter are celebrated in Heaven -- or Passover, Feast of Tabernacles, etc.? ... On Earth as it is in Heaven, remember?). Again, if Jesus entered your church, would He find disciples healing the sick (as Peter did) and casting out demons (as the 70 evangelists did)? Or would He hear condemnation of those acts as heresy? Would He hear a message from the pulpit saying, "While we are to try to keep the Ten Commandments, it is not necessary [to keep them] to receive eternal life. Jesus did away with those ‘Old Testament Laws’ and nailed them to the Cross". Do you think He might want to stand up and shout, Remember what I told you in Matthew 19:17: If you would enter life, keep the commandments! These are just a few of my thoughts about how Jesus would look upon The Church today. Are we hearing His voice? And does He know us? Are we truly following Him in ALL His ways? Are we producing any fruit? And if so, is it fruit that He recognizes -- or is it the world that commends us? My spirit just keeps bombarding me with all these thoughts because I sense that the Harvest is near. And as the Church, it is incumbent upon us that we ask ourselves if we have prepared the soil (the world) to receive the seed (His message of the Kingdom); if we have cultivated that soil (broken up the plans of the Enemy to deceive the world) so that our King might reap the harvest He left us in charge of. You see, I fear that we have concentrated on watering the plants in our own garden (our church buildings) instead of preparing and cultivating the fields in the outside world. And while I see fruit being borne within the assembly, the world doesn't seem to get to share in savoring the sweet taste of Jesus. With His return eminent, I suspect that Jesus is looking forward to a Great Harvest. The Church was to play a part in bringing that about, both in the spiritual and physical realms. How have we stood the test of time, and how will He judge us? And He said to them, "The harvest is plentiful, but the laborers are few. Therefore pray earnestly to the Lord of the harvest to send out laborers into His harvest". Everything you said rings true! Only God can change the heart of the Church after hundreds of years of man's indoctrination... and you've given me some insightful material for a new blog. Thank you!